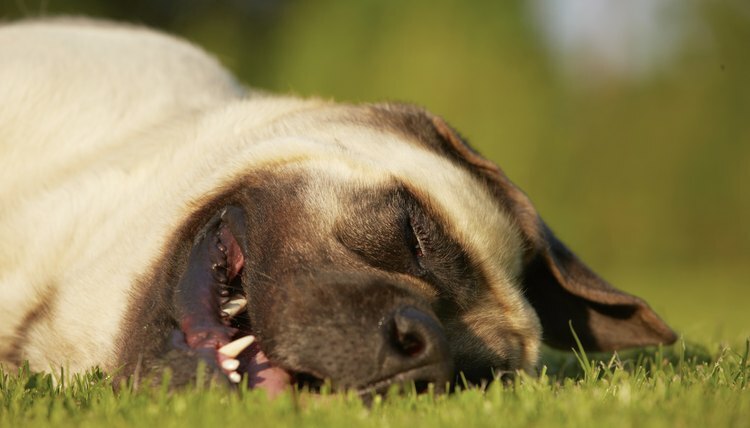 It’s likely that your pooch sleeps more than twice as much as you do each day. On average, between naps and full-on sleeping sessions, your furry buddy spends about 14 hours each day getting some shut-eye depending on his age, breed and activity level. If your barking chum is younger, he’ll likely sleep around-the-clock, much like a newborn baby. Puppies sleep anywhere from 18 to 20 hours a day. Certain breeds, particularly large and giant breed dogs, tend to sleep extended periods of time, even as adults. So if you have a mastiff, Great Dane, Saint Bernard, Newfoundland or Great Pyrenees, don’t be surprised if he spends 16 to 18 hours a day catching some z’s. Working dogs who actually have jobs to do, such as an Australian shepherd working on a farm, probably won’t have time to snooze for the average 14 hours a day and might sleep less. No matter the breed, once your four-legged family member reaches his golden years -- between 7 and 10 years of age -- he’ll gradually start to sleep a bit more than he used to. PetPlace.com: How Long Does a Normal Puppy Sleep?